With only 3 g of fat in a 3 oz. serving, pork tenderloin counts as a healthy, high-protein meat, reports the University of California Berkeley "Wellness Letter." 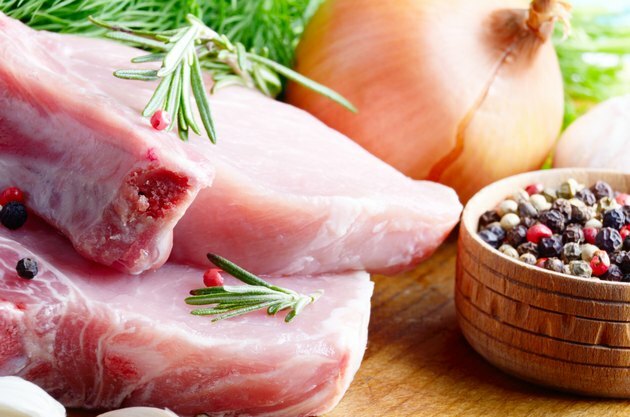 However, while pork is 50 percent leaner than it was 25 years ago, to maintain its healthy status requires that you serve it in small portion sizes and trim visible fat in all your recipes. Add lots of flavorful and filling additional ingredients to round out your meal, such as vegetable salads and mashed sweet potatoes. Pork loin works well with quick sauteing in just enough oil to cover the bottom of the pan. Slice the loin into 1-inch slices, and cook for 2 to 3 minutes on each side. Remove the pork to a plate, and deglaze your pan with chicken stock, wine or a mixture of the two, scraping all the brown bits of pork off the bottom of the skillet. Let the mixture thicken slightly, and stir in 1 tbsp. of butter. Add sauteed mushrooms and chopped parsley on top of the loins if you choose. Use pork loin cut into strips or cubes to serve over rice or noodles in stir fries. Saute aromatics first, such as onions and garlic. Then add vegetables such as broccoli, red or green peppers and mushrooms. Remove these ingredients to a separate bowl, and saute the pork. When the pork is done, add all the other ingredients back into the skillet, add a sauce thickened with cornstarch and bring everything back to a simmer. Cooks.com recommends a sweet and sour pork dish with a sauce made from ketchup, apple juice, apple cider vinegar, apricot jam and fresh ginger. Add carrots, cabbage, water chestnuts and pineapple chunks in addition to the pork. A heavy skillet is your best choice for frying because the oil heats evenly. Mark Bittman, food writer for "The New York Times," recommends cast iron. For a fried pork loin sandwich, pound 1-inch loin slices until they are thin; dredge them in a mixture of flour, cornmeal, salt and pepper; and fry them in ½ to 1 inch of oil for 1½ minutes on each side. Drain the medallions on paper towels, and serve them as you would hamburgers. Cooks normally reserve braising for more fatty or tough cuts of meat, but this long and slow method also works for a pork loin. You'll need a tight-fitting domed lid for your skillet in order for the loin to fit and to prevent the liquid from evaporating. Sear your loin first on all sides, add enough liquid to cover the loin half-way and cook on low until tender, about two hours. Cooks.com braises a loin in milk, along with two cloves of garlic and a bay leaf. The Epicurious website suggests a spice mixture of pepper, bay leaf, garlic and allspice, along with chopped onions, bell peppers, crushed tomatoes, white wine and beef broth.